Explosive Ordnance Disposal (EOD), Singapore Armed Forces (Retired). IEDD/ EOD Trainer-Mentor: UNMAS Projects in Somalia and Iraq-Kurdistan. Principal Technical Consultant, Gravitas International. Adjunct Trainer, ICPTVR – RSIS, NTU. Associate Practicing Management Consultant (APMC), Singapore Business Advisors and Consultant. 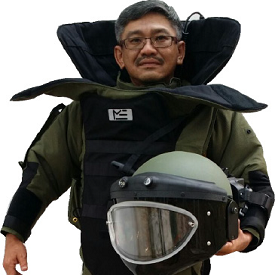 Gerard was a EOD-Counter Terrorism (Analyst) practitioner with 36 years of experience with the SAF before retiring to sharpen his skills further in the hostile theatres of Somalia and Iraq-Kurdistan with the United Nations Mine Action Service (UNMAS). He is also a certified Associate Practicing Management Consultant (APMC) with the Singapore Business Advisors and Consultant Council (SBACC), and is currently with Gravitas International as its Principal Technical Consultant – EOD/IEDD/Counter Terrorism disciplines. During his tenure, Gerard had held Command, Staff and Instructional portfolios in the EOD unit and the Chemical Biological Radiological and Explosive Defense Group (CBRE). As a senior member of the EOD fraternity, he was often involved in the formulation and development of EOD Doctrines, Tactics, Techniques and Procedures. Cardinal appointments that he had helmed were: Sergeant – Major of the EOD Battalion, Senior Trainer, EOD Wing and a pioneering member of CBRE Data Centre. His operational experiences over the years included over 180 EOD related missions in the fields of Disposal of Explosive Ordnance Remnants of War (ERW), Improvised Explosive Devices Disposal (IEDD) incidents, Post Blast Investigation (IED forensic) and Search Operations- national security events held in Singapore. He had previously been called upon to provide technical support and assessment to Home Team agencies. Apart from the training he received in the SAF, Gerard was also schooled in overseas institutions that include: IEDD and Search Operations in the United Kingdom; Post Blast Investigation, US Alcohol, Tobacco and Firearms( ATF); NATO Counter IED Course. Notably as a trainer, Gerard designed and actuated the inaugural C-IED course for the Singapore Combat Engineers in August 2009. He had also conducted course and lectures for SAF Security Agencies, Ministry of Home Affairs Agencies, The Singapore Police Force, Singapore Civil Defense Force, Singapore Airlines, SMRT, Ministry of Education and Singapore Customs.